The word that always comes to mind when I put my first step in the warm turquoise blue water surrounding the Christmas Island is “Paradise.” The gentle breezes, deep blue sky patched with cotton candy clouds, and miles and miles of sandy flats. No phones, no internet, and no TV, I am only preoccupied with one thing and one thing only, BONEFISH. 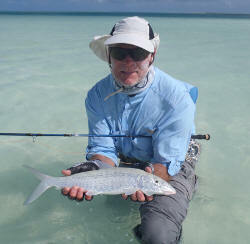 For me, walking the flats hunting for bonefish represents precisely why I am obsessed with fly fishing. And I definitely got my fix on Christmas Island, stalking, catching and releasing countless bonefish ranging 2-5 pounds. And if I ever get tired of chasing these Ghosts of the Flats, then I had the King of the Flats to contend with. In fact, the Giant Trevallies, aka King of the Flats, ruled the flats during our trip. Some were even pushing 100 lbs. Check out the photo of a 90 pound GT caught and being embraced by Tony Smith, who muscled this King for an hour and a half with his Sage xi2 12 wt rod. Great job, Tony! I caught one that was mere 40 lbs. and I almost gave the rod to my guide after 20 minutes of not gaining any leverage on the fish (whimp). Our entertaining group of 8 consisted of: Bob and Jeannette Allen, Rich and Mary Lou Garrett, Lee Smith, Tony Smith, our leader Joe Libeu, and myself. Everyone had a great time, caught some nice bonefish and GTs, and thanks to the Allens and Lee, we also enjoyed unlimited fresh sashimi every night. 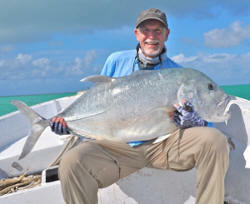 The trio embarked on blue water fishing one day and caught more fish than we can consume in a week’s time. We had laughs, exchanged graceful fishing lies with each other, and truly had a wonderful time. Sierra Pacific Fishing Adventures hosts at least one salt-water destination trips each year, so stay tuned as we unveil 2012 trip in a couple of months (we’ll time it when you maybe steelhead fishing in subfreezing temperature and asking yourself why put yourself in that misery).